David Rothkopf, Superclass: The Global Power Elite and the World They Are Making, Farrar Straus Giroux, 2009. Each of them is one in a million. They number six thousand on a planet of six billion. They run our governments, our largest corporations, the powerhouses of international finance, the media, world religions, and, from the shadows, the world’s most dangerous criminal and terrorist organizations. They are the global superclass, and they are shaping the history of our time. 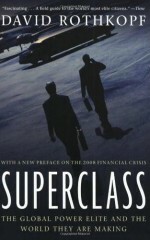 Today’s superclass has achieved unprecedented levels of wealth and power. They have globalized more rapidly than any other group. But do they have more in common with one another than with their own countrymen, as nationalist critics have argued? They control globalization more than anyone else. But has their influence fed the growing economic and social inequity that divides the world? What happens behind closeddoor meetings in Davos or aboard corporate jets at 41,000 feet? Conspiracy or collaboration? Deal-making or idle self-indulgence? What does the rise of Asia and Latin America mean for the conventional wisdom that shapes our destinies? Who sets the rules for a group that operates beyond national laws? Perhaps. But it's likely to take more than exhortation. In the words of former Navy Secretary John Lehman, "Power corrupts. Absolute power is kind of neat." Why would the superclass want to give it up?